Lying below the confluence of the Zambezi and Sidinda rivers, Sidinda Island Lodge offers gorge fishing where guests get an exclusive 16km stretch of water. 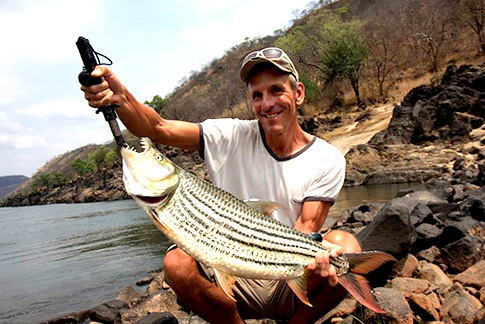 Due to the water condition the Tiger Fish in these waters tend to be more athletic and streamlined offering Fisherman more of a challenge! Prices are quoted per person sharing. The package excludes visas where required, drinks & additional items not mentioned in the package. Prices are quoted per person sharing and based on a minimum of 6 people travelling. The package is based on flights with BA Comair which due to flight daily. SAA fly's daily to Vic Falls from Johannesburg but the package price will differ. Package prices will vary if the costed class of flights is not available for the dates you have requested. The package excludes visas where required, drinks not mentioned & additional items not mentioned in the package. Guests flying into Victoria Falls do NOT require a yellow fever innoculation however guests that fly into Livingstone (Zambia) are required to produce a yellow fever innoculation certificate on their return to South Africa. Sidinda Island lodge is below the Vic falls where the Zambezi and Sidinda rivers meet which is about 80km from the renowned Victoria Falls town. 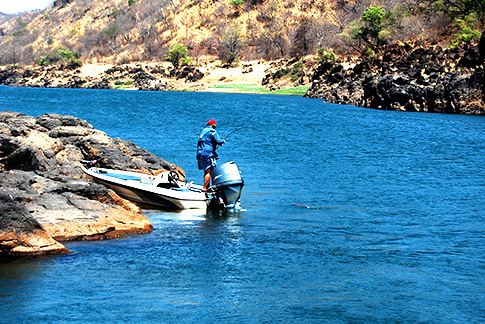 Sidinda offers guests dramatic gorge fishing and exclusive use of 16km of river which includes calm and stirring stretches of water accompanied by striking scenery. Tiger can be caught by a variety of methods such as fly fishing, trolling, spinning, drifting and bottom fishing and one can also use live bait (or a combination). The small sardine (kapenta) was introduced into Lake Kariba some 10 years ago, on a commercialised basis to provide protein for the population and account for more than half of the tigerfish's diet. An interesting trick is to throw handfuls of them from purchased packets to induce feeding frenzies. Best fishing times coincide with the hot season starting in September through to December. Standard bait castings rods or spinning rods for tigers (eg. Shimano Nexave) are ideal for conventional fishing with 9 weights being the Zambezi standard weight for fly, (the average tiger is 5lbs so a small weight can be attempted). Fly line needs to be matched to the rod with an intermediate line working very well. Guides per group of 3 fishermen: one guide with a Pirhana and one guide with a Dory. Chalets are configured for 2 people but are large enough to accommodate an additional bed. Generator power which is switched off at 11 pm each night.